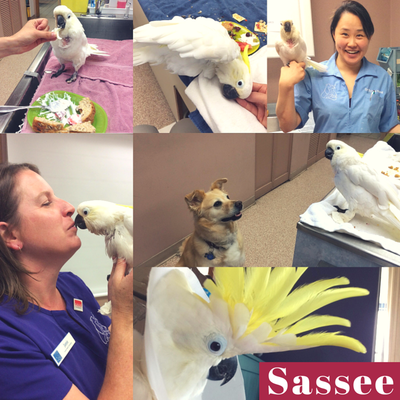 Sassee is a spry 39-year-old Cockatoo who had a mishap in her cage and needed a toe amputation. Due to circumstances at her home, her owner was unable to care for her until she made a full recovery, so we took her under our wing (pun intended). She lived with us for 2.5 months and she went home last week! Between fashioning a Cockatoo sized cone, bird bandages, and bird socks, she certainly brought out the creative side in us. During the day she would keep us company in the treatment area, so if you’ve visited recently and heard what we can only describe as the Velociraptor sound, that was Sassee! She let the whole hospital know when she wasn’t getting enough attention. She lives up to her name and then some. She had a diverse palette, including yogurt, bread, strawberries, blueberries, grapes, pretzels, crackers, peanuts and pasta! She knew how to entertain as she was always talking and dancing. There’s just something about a bird bobbing up and down that will immediately brighten your day. Her favourite phrases were “Hello” and “Hi Sassee” and you couldn’t help but repeat it back to her. She was also very affectionate and would often walk over to you and nuzzle her head into your hand looking for pets. Her owner updated us that she is doing great at home. We are so happy she made a full recovery and is now back home, but we definitely miss the daily musings of Sassee aka Sassypants aka Sassafrass!